We created a series of infographics targeting consumers. 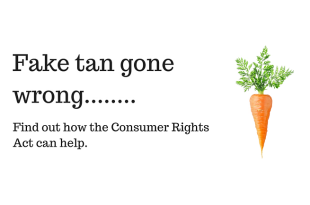 The Consumer Rights Act came into force on the 1 October 2015. It was the biggest overhaul of consumer legislation for a decade, bringing 8 pieces of legislation into 1. The Act set out a simple, modern framework of consumer rights which will promote growth through confident consumers driving innovation and more competitive markets. For the first time, consumers have a clear period of 30 days to return faulty goods, and have rights when buying digital content. The Act was a fundamental reform of consumer legislation. Our job was to communicate the main changes in the law to consumers and businesses; ensuring that consumers and businesses knew what their rights and responsibilities were. This is a challenge in itself- made even more challenging by the fact that no budget was allocated to this campaign (and, as is more and more the case, scant resource). We were also building on digital activity that had been taking place right from the Act’s inception, starting off with an online consultation on the Bill and its proposals carried out in 2012, and featured in a previous case study. We’ve been using digital tools, and partnering with online influencers to get our messages out to the right people right throughout the Act’s lifetime. A snapshot of the social media activity. We communicated with consumers by creating interesting examples and infographics. We created bite-size stories that translated easily into journalist’s copy- and we did a lot of their job for them by thinking of their audiences and writing in a journalistic style that increased the take-up. We made the story attractive for journalists and we got a lot of press coverage; this was the main way in which we communicated with consumers. We achieved a substantial amount of press coverage- 78% of press coverage was positive. We also ensured that the content should be shared digitally. After we refined our messaging and created our content, we needed to spread the word. To do this, we used the networks of our Implementation Group, Consumer Protection Partnership and partner organisations. The Implementation Group communicated with their own stakeholders digitally, and included members that had a strong online presence, such as MoneySavingExpert (MSE). MSE ran their own campaign and have included messaged on the CRA in their regular communications, which reaches millions of people. The majority of our stakeholders incorporated our messages into their regular communications. To see some of these products, and for a more detailed breakdown of coverage, view the evaluation. 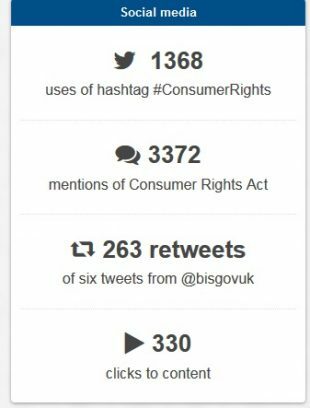 We achieved what we set out to achieve; businesses and consumers know about the changes to consumer law. These results were achieved at low cost to BIS. We got the message out to potentially 500,000 businesses directly. Many more businesses were reached via our press coverage and stakeholder groups. We worked with consumer groups (Which?, Money Saving Expert and Citizen’s Advice) to raise consumer awareness, and research shows that 56% of people have heard of the CRA- about 35m people. The team worked across BIS, and drew on expertise from the policy experts, digital communication team and Press Office. We also worked across Departments, harnessing HMRC and DWP’s reach to businesses, as well as with businesses, trade bodies and consumer groups, being ambassadors for BIS. We also worked across BIS more widely; for example by using the Construction Leadership Council to disseminate sector specific messages, the Enterprise Stakeholder note and the Retail Group newsletter. We produced eye-catching infographics and short digital ‘stories’ demonstrating how the Act worked in practice. We had no budget for this campaign and used the resources we had available such as BIS connect and by using our partners’ communication channels and being innovative in producing infographics and media briefing. For example, we came up with short ‘stories’ that bought the Act alive for people; these were welcomed by journalists and helped generate media coverage; which in turn raised awareness. We bought the department with us, using intranet articles and taking advantage of huddles and group-wide events. Clearer and more consistent success measures at the start could have helped the focus of the project. Also, with even a little bit of budget we could have improved the quality of some of our products. Had we had a larger budget, we could have considered a full campaign, similar to that for the National Living Wage. Had we had more resource, we could have produced more targeted communications for different audiences. This is a great example of digital activity simply becoming 'business as usual' for a team, and marks the culmination of a process that started with an online consultation, and regular digital activity over a prolonged period of time to get the messages about the Act and its benefits to relevant audiences.